I’ve owned Weber Smokey Joe grills off and on for over 20 years. I bought my first one in college, and grilled all manner of meats and vegetables for myself and my roommates. After a 45 day period of trying out vegetarianism I grilled a 16 oz New York Strip on that little Smokey Joe. I still remember that steak. Through moves, across country and out of country, I’ve lost and replaced it a few times since then. Once my moving and changing countries slowed down, I changed over to full sized grills – first a series of full sized Webers, and then a Big Green Egg. While I love the Big Green Egg (or BGE for us aficionados), it weighs in at over 400 pounds (200 kilos). It does not travel. It barely moves houses. So, recently when I wanted a portable charcoal grill to use at Bonnaroo I picked up another Smokey Joe. A few things have changed in the Weber product line-up in the last decade or so. They have the Smokey Joe that I am familiar with, now called the Silver, and a newer model called the Gold. There is also a Jumbo, but I haven’t used one and it didn’t seem to fit my needs. I made the mistake of reflexively buying the Gold, as that must be better than the Silver. And it does have a nice feature over the Silver, that the lid can be locked down with a metal loop, which also serves as a lid holder when in use. 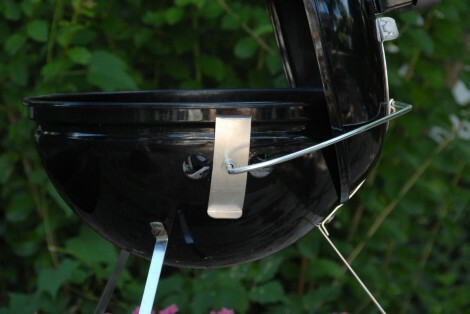 However, for increased portability, the traditional Weber bottom vent moves to the sides. I didn’t notice this when I ordered it, and it would have affected my decision. I prefer the bottom mounted air vent – I find it more effective and easier to control. The grills are still made as well as I remember. They are moderately thick steel, enameled, with aluminum controls and legs. The grilling grid is chromed steel, as would be expected at this price point. The grill was easy enough to assemble with a Leatherman and a quarter, but real tools would have helped a little bit. In use, the Smokey Joe Gold did fine. Although I would prefer the traditional air controls, I have no complaints. Also, when I was finished with it I locked the lid down, closed the vents, and threw it in the back of my truck for a 600 mile trip and didn’t spill any ash at all. 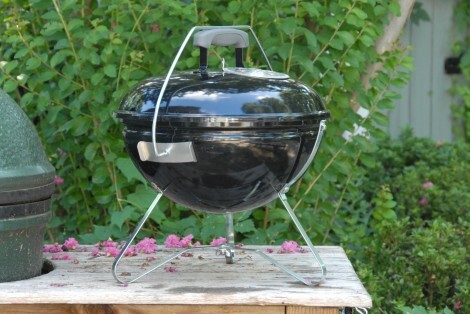 Do you use lump charcoal in your weber like you would use in your BGE or do you use “briquette” Charcoal? Sorry, just getting around to sorting through the comment queue. I use either in the Weber. If I have lump charcoal I will use that; works fine, less ash (actually, less clay or sand… but less to clean up). 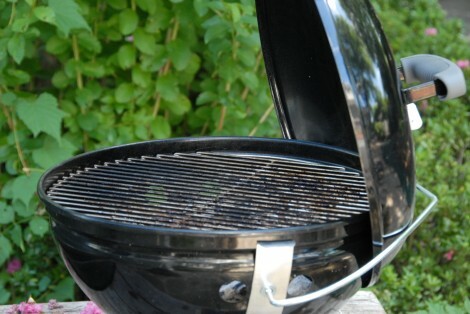 At the sometime, sine the Weber is so easy to clean, and because I won’t be reusing the charcoal, briquettes work just great. In fact, in the smaller volumes used in a Weber they are often much more consistent, and the price is better. So, I will use whatever is within reach – but briquettes are just fine.